Lubbock’s local Fox affiliate, FOX34, did a story on the Harvey House of Slaton recently. We repost it here, but if you click through to the original, you’ll see that it includes a video. We hope you enjoy it. You could say the Harvey House helped put Slaton on the map when it was built on the Santa Fe Railway in 1912. Though it has seen a lot of change over the years, the building maintains its historic charm. The community has banded together, and over a 14 year process, the railroad depot spot is now a historic bed and breakfast. Historian, Jolene Fondy, said locals and visitors can experience life in the Harvey House as it was in the 1920’s. There are four rooms available for accommodations that include period-correct furniture and decor. 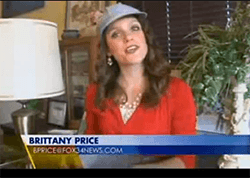 Fox 34’s Brittany Price gets a tour of the landmark. View the attached video (on original article) to see and learn more.